The graduate job market is competitive. You need to use all opportunities available to you to give yourself the best chance of getting the job you want when you finish university. Work experience – yes, Enthusiasm – yes, Networking – yes. They are all important components – make the most of any opportunities that are offered to you – especially those that enable you to engage with employers, this is such valuable experience. Most universities run Careers Fairs and GSM is no exception. 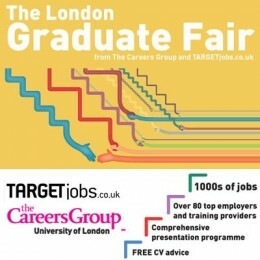 In today’s competitive graduate job market, why wouldn’t you attend a Careers fair? Remember the expression ‘it’s not what you know but who you know’? Careers fairs are a great opportunity for students to find out more about potential employers; an opportunity to talk to people, to network and get a feel for the career you intend to pursue. You will be able to find out lots of information to help you select companies that you wish to apply to and this information could potentially enhance your application; networking can open doors. The careers fair isn’t a job interview, but it could lead to one so try to create a good impression; first impressions really do count. In order to give yourself the best chance of making an impression for the right reasons, it’s essential to do your research. Make sure you know which companies are attending and what they do – do not ask a business what they do or what sector they operate in – this information should be available for you to find out beforehand. Although careers fairs don’t operate official dress codes, you want to appear professional in both attitude and appearance. My suggestion would be to look reasonably smart – it shows you are taking the event seriously and when you’re talking to recruiters avoid chewing gum or using your phone, don’t cross your arms and take your hands out of your pockets. Do not ask for a ‘goodie bag’ and then tell them you don’t want a brochure! This is an opportunity to enhance your chances of getting a job not to collect freebies. Make sure you look like you want to be there! The company representatives will have met many students and potential candidates and will meet many more in the future – they may or may not accept CVs on the day, don’t be offended if they don’t. If you do take a copy of your CV with you (which I think is a good idea), make sure it’s up to date and looks professional. You want to stand out for the right reasons. Careers fairs will be very busy for recruiters and it can be difficult for them to speak to any one candidate for a significant length of time. Where possible collect business cards as this enables you to follow up as appropriate – you could drop them an email thanking them for their time or it may be appropriate to connect with them on LinkedIn – perhaps with alumni? It’s such a valuable opportunity to engage with employers at a careers fair; make sure that you make the most of it and try to enjoy the opportunity too! Good luck! If you have any questions, please get in touch careerszone@gsm.org.uk.